Last week, I accidentally created a new sauce recipe and we’ve been hooked on it ever since. I set out to create a caramel sauce, but after asking Josh to try it, we decided it tasted more like toffee…totally not complaining. It has a bold, rich flavor, but unlike the typical cooking process of caramel or toffee – this requires no boiling, butter or refined sugar. In fact, heating the sauce is optional! The best part is, Willow asks for it all the time – so you know it’s good when it passes her approval! ***To receive the full benefits, make sure you’re using raw tahini! So, you can see why I sneak it into everything from raw chocolate, smoothies, sauces and more! Now for the recipe! I know that I just shared an oats recipe last week, but oddly enough, it was one of my most popular posts. People LOVE oats! The one I’m about to share with you is very much like a dessert…because who can say no to dessert for breakfast?! This comes in two parts – making the sauce and making the oats, but I promise it’s super simple! In a small bowl, whisk together all of the ingredients until smooth. If your mixture is too thick, slowly add more water. You can use as is or in a double boiler, gently warm the sauce. Be careful not to get it too hot – you don’t want to burn it. The sauce may thicken some as it heats. In a small pot, combine your oats and milk. Stirring often, cook over medium heat. Once boiling, lower the temperature. Cook until desired consistency is reached or until the liquid is mostly absorbed. 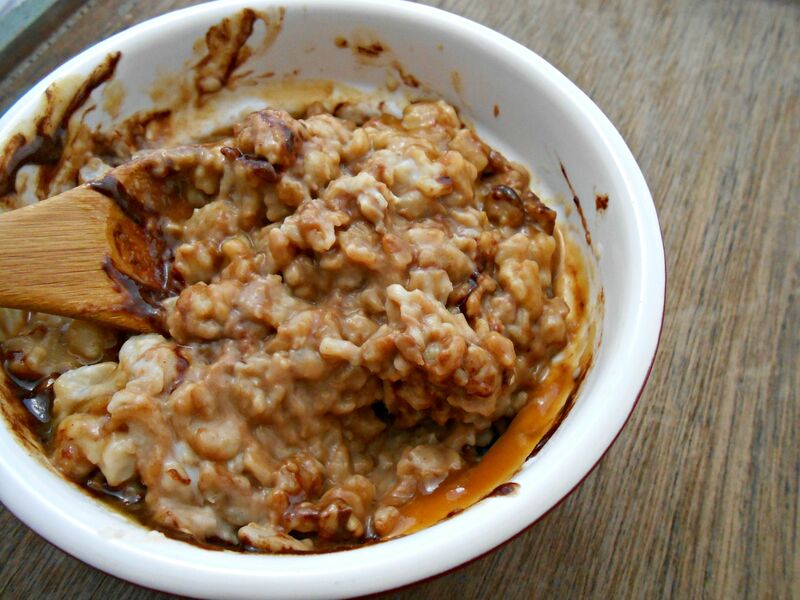 OPTIONAL STEP: While the oats are cooking, gently warm the toffee sauce using a double boiler. I recommend this step to maintain the warmth of the oats. Once the oats are done, divide them into two bowls (or three). Top with some mini chocolate chips and a generous drizzle of toffee sauce. 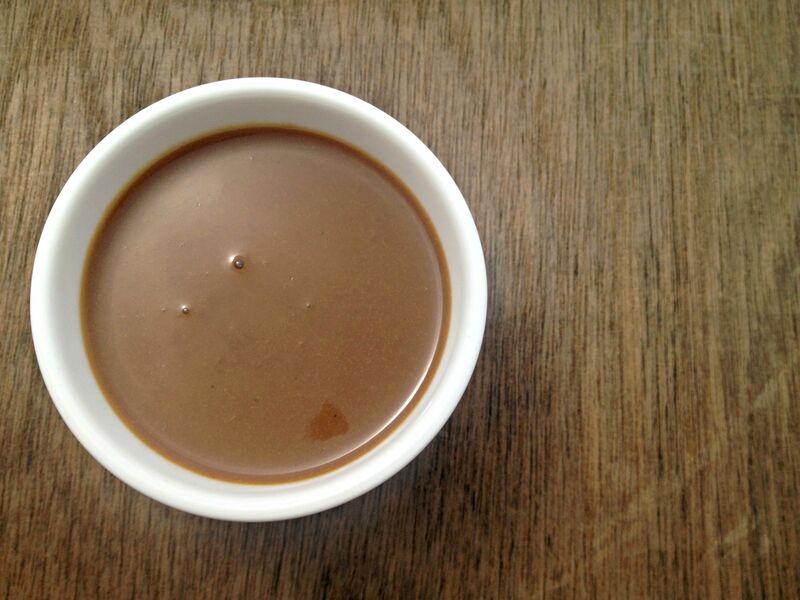 Stay tuned next week for another recipe using the Toffee Sauce! I’m so happy you posted this recipe! It looks simple and absolutely delicious! Will be making this in the very near future! Thank you, Diana! It’s incredibly simple and very addictive! I think you’d really like it ❤ This might officially push you over to the tahini side! Sounds delicious!! I’ll have to try that sweet sauce. MMMMM. Done, mandy! 🙂 Made it this morning. I was so eager to see your recipe — the preview photos looked amazing. Tried it as soon as I could. It’s super hot over here today though — too hot for oats or porridge, so I used it on my nana ice cream at breakfast and LOVED it. Mandy this looks so good, I nearly died!! You know how much I love tahini and coconut sugar as well!! I make my toffee fudge with coconut sugar and sweet potato and I have a toffee ice cream coming! This has me drooling, can’t wait to try it!! I make a tahini caramel all the time with syrup, but it definitely is coconut sugar that gives that toffee flavor….so incredible! Can’t wait to try this sauce!! Amazing recipe girl!! You are speaking my language! This toffee sauce is amazing! I love tahini and this is one more way to enjoy it. 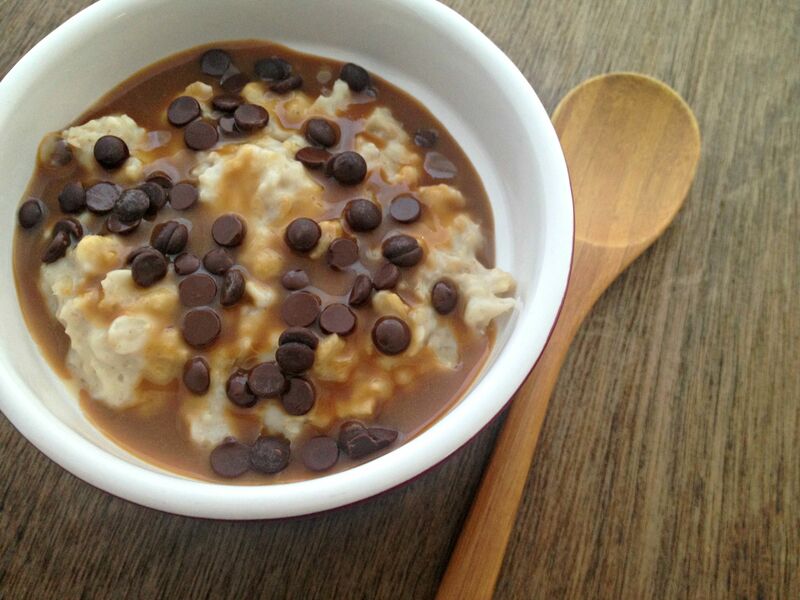 Love the chocolate toffee oats…….yum! YUMMMM Mandy! 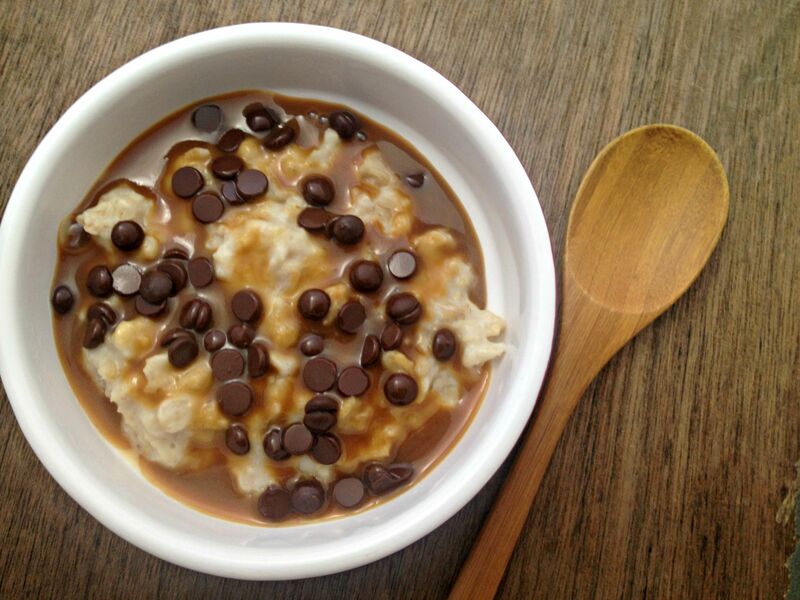 This looks like everything I’d want in my morning oatmeal. I need to make your toffee sauce! Is there anything i can use instead of coconut nectar? I don’t have it on hand…THANKS! 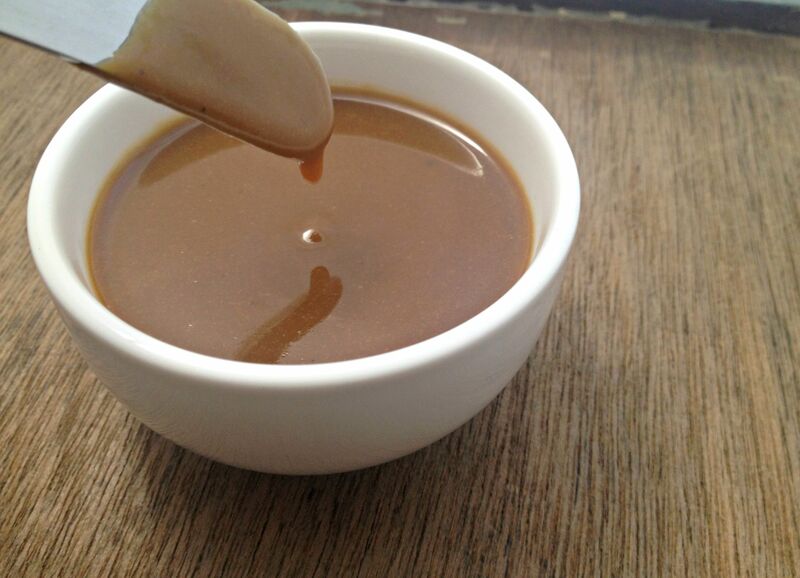 What a wonderful toffee sauce recipe! When I saw it I knew I had to get my booty in the kitchen to whisk it up ASAP. I love how much flavor the coconut nectar and coconut sugar add to it. Totally toffee-like! I bet when someone who doesn’t like tahini would love this. Can’t wait to drizzle it on…everything! I’ll bet you didn’t put as much toffee sauce on them as I did when I made them! Ha!!! I’m hoping this darn oat sensitivity doesn’t last long because I sure do miss oatmeal!! And when I do get to eat it again, I’m definitely using some lite coconut milk to make them! You are WAY TOO sweet and I can’t tell you how much your words meant to me. Thank you for sharing that photo, it looked AMAZING!!! !